Invertebrate Paleontology course at The College of Wooster | The joy of fossils! Graptolites are disparate, fussy, and a bit strange, but they have significant biostratigraphic value. Our graptolite specimens for the most part look like little black hacksaw blades painted on black shale, so you may appreciate the better images on the Web. The Wikipedia graptolite article is short but informative. An amateur collector has put together a good presentation of Ordovician graptolites from the Athens Shale of Alabama. Here are some useful links for the annelid worms. The group that we cover systematically is the Family Serpulidae of the Class Polychaeta. You’ve seen twisty white serpulid worm tubes for awhile in the laboratory. They encrust virtually any marine hard substrate, from rocks to corals to boat hulls. Let’s start with the Wikipedia page for trace fossils. Wooster has an excellent collection of hardgrounds, especially from the calcite seas of the Ordovician and Jurassic, on which we will see many borings. We also have a good soft-sediment trace fossil set, much of it inherited from the late Professor Richard G. Osgood, Jr. Final Lab & Lecture Exam: December 10 (Monday), noon – 2:00 p.m.
Encrusting graptolite (Thallograptus sphaericola) on the rhombiferan cystoid Echinosphaerites aurantium (Middle Ordovician, northeastern Estonia). Here’s a great article on the eyes of scallops. They are much more sophisticated than I thought. An unfortunate but not uncommon fight has broken out over the ownership of fantastic dinosaur fossils on private land. It may come down to what the definition of a mineral is, as in “mineral rights”. These fossils, of course, should be in a museum. Speaking of museums, here’s a story of an important Cretaceous bird fossil recognized for what it is a full 25 years after its discovery and deposition in a museum. There are many treasures in museums waiting for trained and interested eyes. Here’s a New York Times article describing the Permian Extinctions — and comparing these horrific events to the effects of climate change today. Be very afraid. The Phylum Echinodermata continued! Please see the links for last week. Your final two quizzes (#11 and #12) will be “superquizzes” with lots of extra credit. Quiz #11 will be fill-in-the-blank questions from the first half of the course (through bryozoans); quiz #12 from the second. 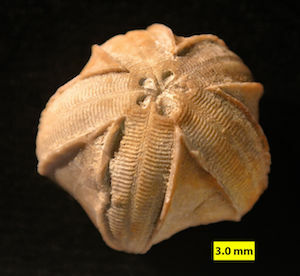 Pentremites godoni, a blastoid from the Lower Carboniferous of Illinois. How to read a scientific paper? Here are some useful ideas. The hemimastigophorans are a strange group of organisms currently classified at the phylum level. Recent genetic studies show that they are radically different from animals, protists, fungi and plants, meaning they represent a branch of life at the ‘supra-kingdom” level. There is still so much we don’t know about life, let alone life’s history. A 31-kilometer-wide impact crater has been discovered under Greenland’s shrinking icecap. 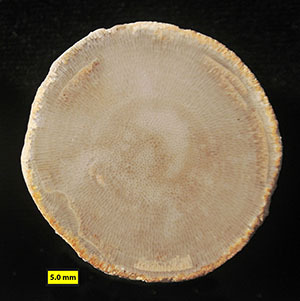 So far it has been dated to be sometime in the Pleistocene, but there is much speculation that is is connected to the Younger Dryas climate event. For an excellent review of the topic, see Dr. Crawford’s recent blog post. A cuddly little therapsid named Kayentatherium has been found preserved with 38 tiny babies. This discovery has implications for mammal evolution because this clutch size is more reptilian than mammalian. The Phylum Echinodermata is upon us. These organisms could be from Mars if we didn’t know better. You will first want to visit the fantastic echinoderm page of the Tree of Life Project. (Friend of the department Bill Ausich of OSU is a member of the Tree of Life echinoderm team.) I find the images on the Animal Diversity Web for echinoderms page (University of Michigan) to be useful. There are numerous websites for specific echinoderm groups. The best I’ve found include ophiuroids, echinoids, the crown-of-thorns starfish, and the Wikipedia page on crinoids. Also check out this nice page on the Carboniferous Crawfordsville crinoids — some of the best in the world. This echinoderm webpage by Teresa Zubi is a lot of fun. (Well, OK, some fun.) This clip of a “sea pig” (Scotoplanes — a holothurian) in deposit-feeding action is a classic. And you won’t see echinoderms the same ever again after watching this time-lapse video from Antarctica. Creepy, but they get their own from the Icicle of Death. And why are all these sea urchins going to the same place with such grim determination? Jonathan Bird’s Blue World has a video on sea stars that is entertaining. Here’s a nice Japanese clip on sand dollar moving and feeding, and here’s a hauntingly beautiful Brazilian production on the reproduction and development of a sea biscuit. On Tuesday, November 20, by 8:00 a.m., your field trip reports are due on paper to me. I’m sure you haven’t forgotten. Eucalyptocrinites calyx; Kaugatuma Formation (Upper Silurian, Pridoli), Saaremaa, Estonia. Specimen found by Nick Fedorchuk. There is an interesting argument that the Late Cretaceous asteroid hit just the right spot to cause the global extinctions. The hypothesis is that striking an area rich in petroleum injected massive amounts of soot into the atmosphere that further cooled climate. There will be debates soon over this. Here is an excellent BBC article on saving coral. Are we willing to make the change to ensure the survival of coral reefs and thus oceanic ecosystems? So far the answer is a grim no. The search for Oort Clouds around other stars has yielded surprising results, with some evidence suggesting they go back to the early days of the Universe. The Phylum Arthropoda is extraordinarily diverse. These are the animals that will inherit the world, if they haven’t already. Let’s first visit the wonderful and arthropod-rich Burgess Shale, courtesy of the Burgess Shale Geoscience Foundation. (Eight years ago I had my own visit to the Burgess Shale at the Walcott Quarry. Magnificent!) For serious work we hardly need to stray from the arthropod pages at Berkeley and the arthropod Wikipedia page. Please visit the Berkeley onychophoran page for a look at primitive arthropod characters. The trilobite pages are especially well organized. Concentrate on the agnostids and the polymerids (the redlichiids and phacopids being important here for us) An amateur paleontologist (Sam Gon III) has an excellent Guide to the Orders of Trilobites. We will not recognize all the orders, but the images and descriptions here are tremendous. You will also find excellent images of trilobites on the Wikipedia trilobite page. The most comprehensive set of trilobite images is courtesy of the American Museum of Natural History. We now have excellent evidence for trilobite eggs. An excellent “eurypteridology” website is maintained by Samuel J. Ciurca, Jr. Katherine Marenco at Bryn Mawr (and a Wooster geology alumna) found this Eurypterid Tumblr page. To complete your set, please visit websites for the crustaceans, insects and arachnids. You’re too young to remember the bizarre Sea Monkeys craze. It was based on the real science of brine shrimp and cryptobiosis. Who knew the story also involves racism and the KKK? Thought you might like to see this YouTube video on the fossils below the Creation Museum in northern Kentucky. They will be familiar! You may want to see the related videos, like this one on Cincinnatian fossils. You can watch people digging for trilobites for fun and, apparently, profit. You get to do it for free! Anomalocaridid “arm” from the Burgess Shale (Middle Cambrian), Walcott Quarry, British Columbia, Canada. Check out this story (and book) about the illegal trade in dinosaur bones. I’m pleased to see there are serious penalties for stealing from the public — and from science itself. The end-Cretaceous asteroid impact may have had an even more dramatic effect on climate than we thought (and that was pretty bad). I notice here that the asteroid is now expanded from 10 to 12 km in diameter. Here’s a BBC account of the same research. Remember that we have no or lab on Tuesday because I am at a meeting of the Geological Society of America in Indianapolis. I’ll be giving this talk on Wednesday afternoon. Wish me luck. We’ll spend Thursday in class reviewing the results of your second test, then finishing anything left over from our bivalves section. Please review the past links. We will then discuss ideas about the evolution of mollusks. The Wikipedia page on molluscan evolution is quite good. Notice our friend HAM at the top. If you want to dive into the weeds on mollusk evolution, check out this Nature paper on phylogenomics. We will simplify! Your next lab test is on Thursday, November 8. It will go from the bryozoans through the bivalves. The End-Permian Extinction happened much more rapidly than we previously thought. In fact, from this study, it was geologically instantaneous. Life was doing OK until quite suddenly a tipping point was reached to throw it into catastrophe. Implications, people, implications. The ornithischian dinosaur Pachycephalosaurus may have eaten meat, according to a recent paper. It has been found with sharp front teeth typical of a theropod. I think this is a stretch, though, because some plant eaters have sharp teeth. A Cretaceous bird in, you guessed it — China, has its lungs preserved as a carbon film. This is a critical piece of evidence for our theories of bird flight. One lecture this week because of your test on Thursday. Apparently the minor molluscan groups the scaphopods and rostroconchs haven’t caught on enough in the public consciousness to produce many webpages, so Wikipedia will do fine. Ron Shimek has a nice webpage introducing the scaphopods. Here’s one of the few videos of living scaphopods in a laboratory. We’ll get a start on bivalves in lecture and lab. The Wikipedia pages on bivalves and oysters are good, and there is a Wooster touch on each. Here is a nice webpage with some simple anatomical diagrams of bivalves. (A useful page for our dissections in lab this week.) Don’t miss this site on Ohio’s favorite bivalve, the Zebra Mussel. This is a simple index to the common bivalve families, with images which will be helpful in lab. The Monterey Bay Aquarium Research Institute has some good photographs of deep-sea bivalves and other marine invertebrates. Here is a short and good video summary of some molluscan adaptations. It is well done. Your second lecture test is on Thursday, November 1. Here is an example: the 2017 second paleo test. Yours, of course, covers slightly different material. Here is a sample field studies report generously given to us by Alexis. 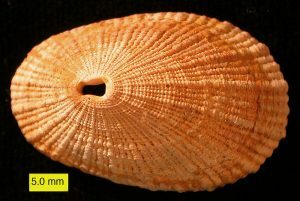 The bivalve Spondylus from the Pliocene of Cyprus. Climate change is producing an insect apocalypse. Many ecosystems have experienced a profound loss of insect diversity and abundance over the past decades. As budding ecologists you know this has many serious knock-on effects, including loss of pollinators and insectivores. My treasured Joshua trees of the Mojave Desert are dying out because their pollinating moths are disappearing. We’ve known that the Earth’s inner core is solid from calculations and formulae, but now we have direct evidence of its nature. Solid but a bit squishy. And really hot. Chemists have found a recipe to build all four nucleotides of RNA in a way that could have happened on the surface of the early Earth. This is a biological breakthrough that could show a theoretical pathway to the RNA World. Very cool. I’ve given you so much bad news this semester about climate change (and we know plenty of other anxieties going on now too!) that you need a set of charts and maps with how much better we have it than our ancestors. The Tree of Life Project has an excellent page on cephalopods; it concentrates on their systematics, but also has good information on cephalopod biology. The Smithsonian has a cephalopod page for professionals and others interested in these creatures. The Wikipedia page on cephalopods is good. 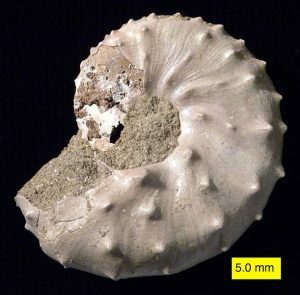 There are many pages devoted to fossil cephalopods, such as this one on ammonites of the Fox Hills Formation in north-central North America. TONMO (The Octopus News Magazine Online — who knew?) has an informative page on nautiloids. Here’s a reference page for coleoids. As a bonus, watch a short video of baby cuttlefish hatching. This very cool video of a blue-ringed octopus was posted on the Scientific American site. In fact, YouTube has hundreds of cephalopod videos. Cephalopods — gotta love ‘em. Here’s a nice octopus-like fossil from the Jurassic. It’s not often invertebrate paleontology makes the BBC news! Essay #2 is due in your dropbox by 7:30 a.m. on Thursday. Discoscaphites iris ammonite from the Owl Creek Formation (Upper Cretaceous), Owl Creek, Ripley, Mississippi. At least one Cretaceous shark (Squalicorax) ate one pterosaur (Pteranodon) based on a chewed-up wing bone. Must have been quite a scene at the time! Here’s a provocative new idea: Mesozoic mammals went through a “nocturnal bottleneck” since they were easy prey for dinosaurs during the day. The result of our night-time habits is that we lost a genetic toolkit for repairing our DNA when it is damaged by solar radiation. Thus the headline saying we need sunscreen because of dinosaurs. Interesting. A terrifying essay on climate change is now making the rounds. Grim, grim, grim. Our leaders have completely failed us on the most important issue in our history. A scientific fight has developed over the earliest fossils. Structures in Greenland have been interpreted as microbial stromatolites 3.7 billion years old. Now a new study suggests that these features are inorganic, not biological. This would mean the earliest evidence for life returns to 3.5 billion year old stromatolites in Western Australia. Hot words have appeared between the two sides. I think the new study has the best evidence, so I would now say the earliest fossil evidence for life is 3.5 bya. We’ll start with a small fossil group recently placed among the lophophorates: the hyoliths. It is fitting to cover the hyoliths right after our other lophophorates, the brachiopods and bryozoans. Whether lophophorates are monophyletic or polyphyletic is currently debated. Here is the 2017 Nature paper placing the hyoliths among the lophophorates. Thanks, Ezra, for reminding me of the hyolithids as lophophorates. Creatures with brains (more or less) are upon us! The polyplacophorans and monoplacophorans are usually covered early in a mollusk series because they have the least derived characters. Not much online about them for us. Gastropods, though, have their web fans. Read through this description of the poisonous gastropod Conus, its biology, and the medical aspects of its toxins. See how many people have been killed by this vicious snail. (“Vicious snail”, you say? Who would guess? Here’s an excellent National Geographic video of Conus catching and eating a fish.) You will be amazed by this website loaded with photos of gastropods in systematic order. 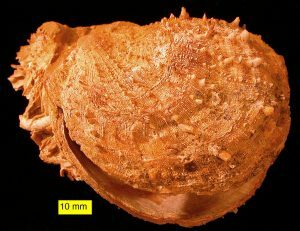 For fossil gastropods, Ron Fine of the Dry Dredgers has a colorful pdf description of Cincinnatian snails. You will find it useful for your field projects, including the introductory pages. The TXFossils site as many good images of fossil gastropods accessed by clicking on the county names. 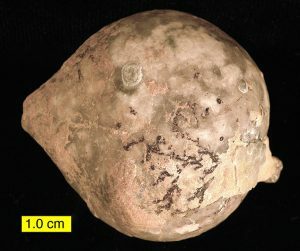 A fissurellid gastropod from the Pliocene of Cyprus. Here’s a nice summary of the latest ideas on the evolution of modern birds. It appears that the Cretaceous extinctions may have sped up their evolution, primarily by selecting for small body sizes which have higher rates of evolution. Here’s a strange new dinosaur from the Jurassic of South Africa: Ledumahadi mafube. It “crouched like a cat” and had strangely flexible forelimbs for a 12-ton animal. We are in a golden age of dinosaur paleontology. There are new discoveries every week. Bryozoans! Everyone’s favorite fossils. When I took this course my professor mumbled at the start of this section, “I hate bryozoans. When I find them, and no one’s looking, I smash them with my hammer!” Bad form. I hope you learn to love the little critters. They can tell us much about evolution and paleoecology, and that curious state of being a colony. You can start your browsing with the Bryozoa Home Page. Many links here, including sites on both recent and fossil bryozoans. Here is the useful Wikipedia page on bryozoans. The Marine Education Society of Australasia has a good introduction to bryozoans. You also want to be sure to visit the page of my friend Paul Taylor, who is one of the top bryozoologists in the world. Here’s a page from The Netherlands on freshwater bryozoans. Some are huge. YouTube has bryozoan movies (of course! ), like this one showing the action of cilia in feeding and a double feature of a bryozoan and Hydra. Oh, and I like this video of bryozoan feeding set to music. The University of Kentucky has a page of bryozoan specimen images, most without adequate scales (a mistake you will never make). In the Paleozoic, especially the Ordovician, bryozoans are very common on carbonate hardgrounds. You also will find the Dry Dredgers’ page on Cincinnatian bryozoans most useful for your field studies. 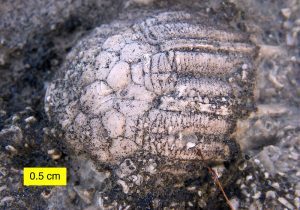 The bryozoan Esthoniopora from the Upper Ordovician (Kukruse) of Estonia. 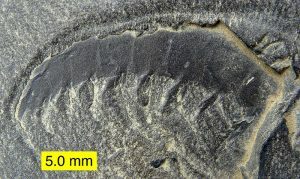 Here is a recent story on Dickinsonia from the Ediacaran. Biomarkers show that it was an animal. This is not a surprising conclusion, but a cool technique. The Japanese have landed tiny space rovers on an asteroid, and they’re starting to send back images. Postcards from the beginning of our Solar System. This will not be news to you, but it is a fairly good accounting: What Darwin didn’t know about evolution. There are some nomenclature errors in this popular article, and poor Wallace should have been in the headline too. Crystals of the hardy mineral zircon are giving us chemical clues about surface conditions on the earliest Earth. Maybe it wasn’t as bad as we’ve thought. There are even hints of life prior to 3.7 billion years ago. Please see the text and links in last week’s web entry. You’ll all learn soon that there are problems with homeomorphy among brachiopods. (A product of evolutionary convergence.) The linked paper provides one example of many. Remember that many brachiopod taxa are distinguished by internal features we don’t always see. Your first lab test is Thursday, September 27, at 1:00 pm. Both lab rooms will be closed at 6:00 am that day, so get your fill of specimens before then. The lab test is timed stations, so if you’re not there by 1:00 pm you will miss stations and thus points. 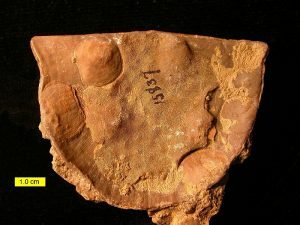 Ordovician strophomenid brachiopod encrusted with bryozoans and craniid brachiopods. You may have heard that mammoths are about to be cloned. Fake news! Great music video on evo-devo. Starts with hox genes. “This is how we go from single cells to people.” The channel A Capella Science is highly recommended! Paleontologists are now using neutron scanners to make ultra-high resolution images of vertebrate fossils. Very cool results. Arctic lakes are now bubbling out massive amounts of the potent greenhouse gas methane. This is not good. Weekly posts for Geology 250. See course notes and syllabus pages for outline, topics, requirements, and deadlines.